Photo by Bryan Stevens • Tree swallows are among the different species of birds returning to the region after spending the winter months farther south. 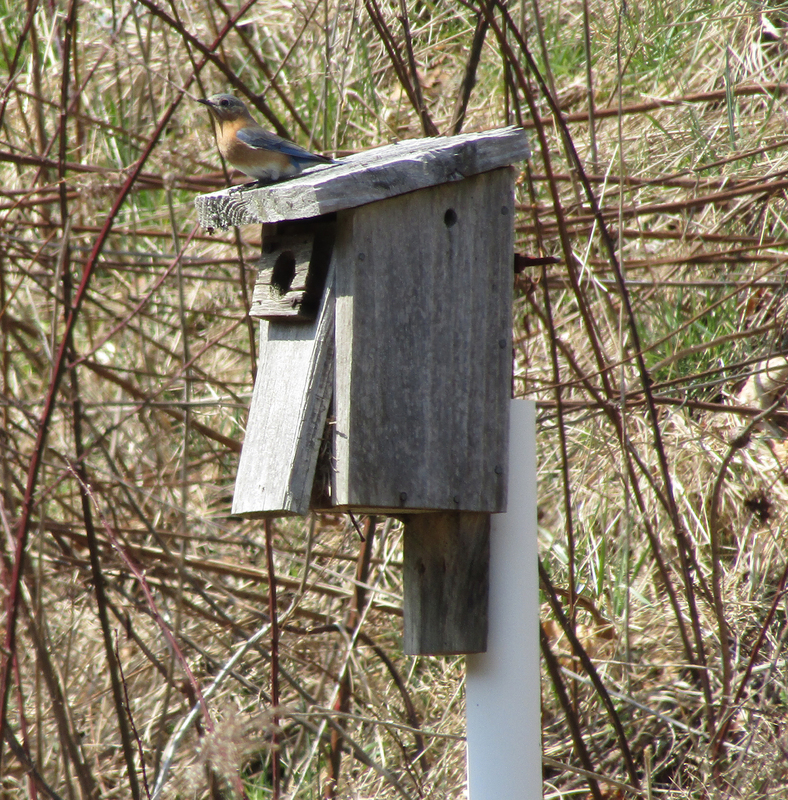 These birds will be looking for nesting boxes or natural cavities in the coming weeks. Waiting for spring? Join the club. Between alternating bouts of unseasonably warm temperatures and frigid blasts, the weather cannot seem to decide if winter’s hanging in there a little longer or if it’s time to proceed with spring’s arrival. You might think that would translate into a messy arrival timetable for some of our returning birds, but so far my own personal observations indicate a different story. For instance, a pair of tree swallows arrived at my home on March 8. Curious, I explored my Facebook newsfeed and discovered that the first tree swallows returned in 2016 on the very same date! These punctual arrivals never cease to amaze me. It’s almost like clockwork for some of the birds that I have observed for many years at my home. In addition to tree swallows and brown-headed cowbirds, other recent returns have included red-winged blackbirds and American robins, which have both been hailed as traditional harbingers of spring. Over the next few weeks, I look for the pace to pick up as returning birds like chipping sparrows, brown thrashers, blue-gray gnatcatchers and yellow-throated warblers mingle with lingering winter birds such as dark-eyed juncos, purple finches and yellow-rumped warblers. The pair of swallows that returned on March 8 probably regretted the timing. Arriving during a warm spell that saw temperatures climb into the high 70s, the swallows were soon enduring a chilly blast that saw the mercury in outdoor thermometers dipping into the 20s. The swallows are insect-eating birds, so extended cold spells often force them to retreat to the area’s lakes and larger rivers, where they can swoop over the water and have an easier time plucking cold-numbed flying insects out of the air. Photo by Bryan Stevens • Tree swallows usually return to the region in late February and early March. Look for other birds, such as brown thrashers and chipping sparrows, to return in the coming weeks. Once milder spring temperatures prevail, the flocks of swallows forced into these necessary habitats will disperse as pairs begin seeking nesting sites. Tree swallows are cavity-nesting birds, which often puts them into competition with Eastern bluebirds. The two species usually manage to work out a truce and settle down to nest in close proximity to each other. The iridescent blue-green male tree swallow, complete with white underparts and a forked tail, is a handsome bird and a welcome addition to the bird population in any yard or garden. Tree swallows enjoy water, so a nearby pond or creek is a boon for attracting these birds. 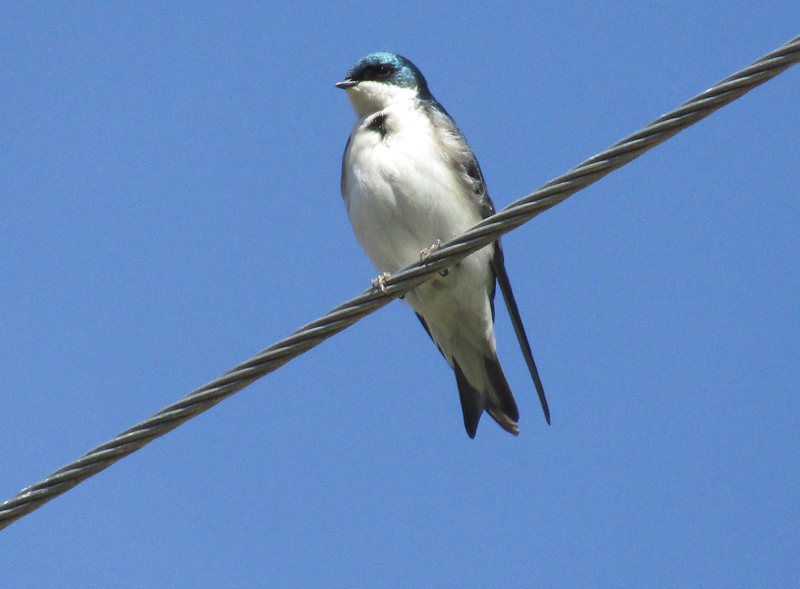 Tree swallows nesting in southwest Virginia are a relatively recent happening. According to Tony Decker’s The Birds of Smyth County, Virginia, tree swallows have only been common summer residents since about 1975. Some of the early records of these birds nesting in the region took place at locations like the ponds in Saltville, Virginia, and Laurel Bed Lake in Russell County, Virginia. Photo by Bryan Stevens • A female Eastern bluebird stakes claim to a box to ward off inquisitive tree swallows. The two cavity-nesting species are often competitors for prime nesting real estate. A decade later, tree swallows began nesting in northeast Tennessee. The first nesting record took place at Austin Springs on Boone Lake in Washington County, Tennessee, according to The Birds of Northeast Tennessee by Rick Knight. 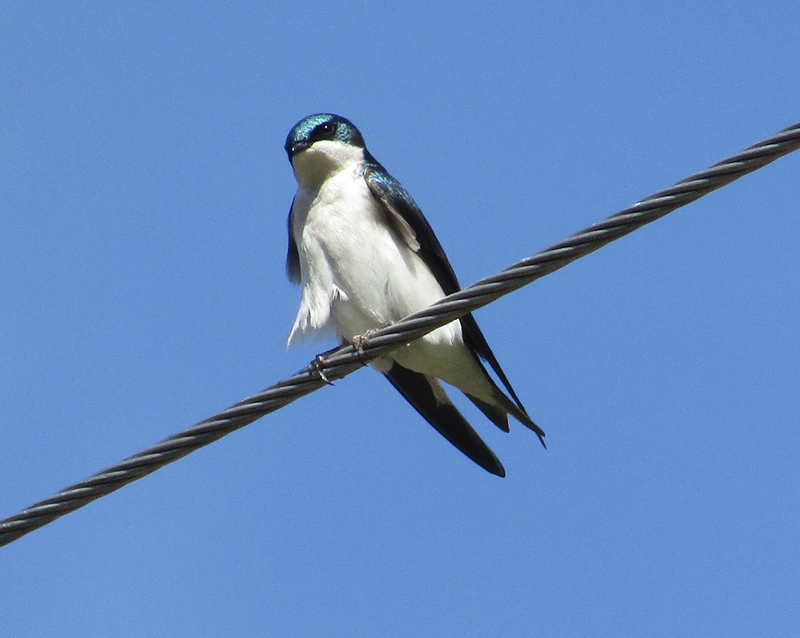 Tree swallows soon became regular nesting birds every summer in all five counties that comprise Northeast Tennessee. It’s usually not too difficult to find five of the six species of swallows that are known to make Northeast Tennessee and Southwest Virginia their home from spring to fall. In addition to tree swallows, other swallows such as barn swallows, purple martins, cliff swallows and northern rough-winged swallows are fairly common summer birds in the region. The barn swallow and tree swallow are the two members of the family that are probably best known to people. They have adapted to life in both suburban and rural areas, which brings them into frequent contact with people. 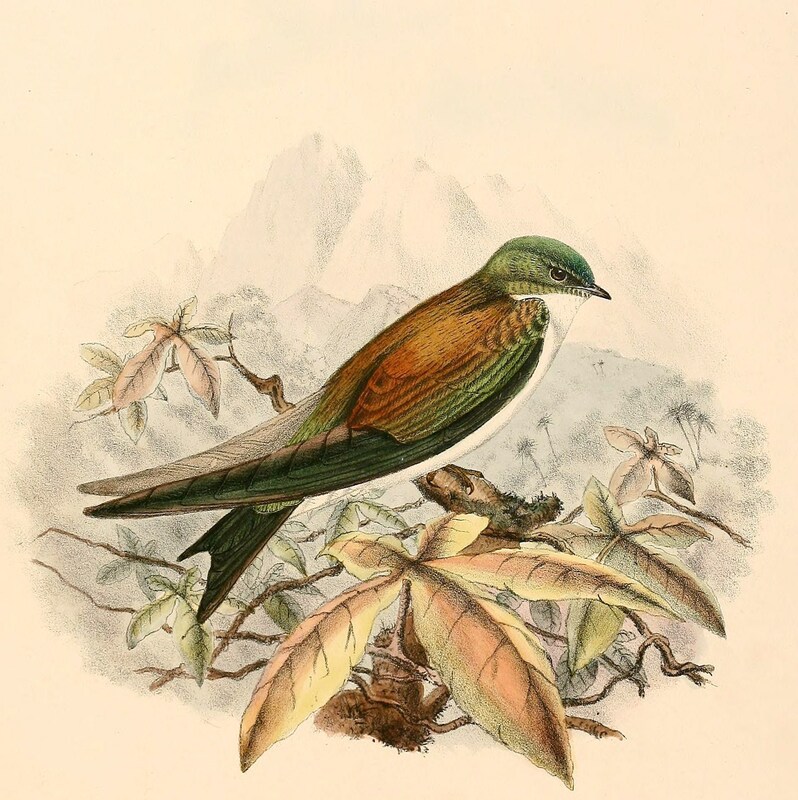 The golden swallow, which today exists only on the island of Hispaniola. While only a few swallows range into the United States and Canada, a total of 83 species of swallows can be found worldwide. Some of the common names for these different swallows (also called martins in other parts of the world) are quite descriptive. A sampling includes white-eyed river martin, grey-rumped swallow, white-backed swallow, banded martin, blue swallow, violet-green swallow, golden swallow, brown-throated martin, brown-bellied swallow, pale-footed swallow, white-bibbed swallow, pearl-breasted swallow, red-breasted swallow, mosque swallow, fairy martin and streak-throated swallow. Photo by Bryan Stevens • A male tree swallow perches on a utility wire extending over a fish pond. 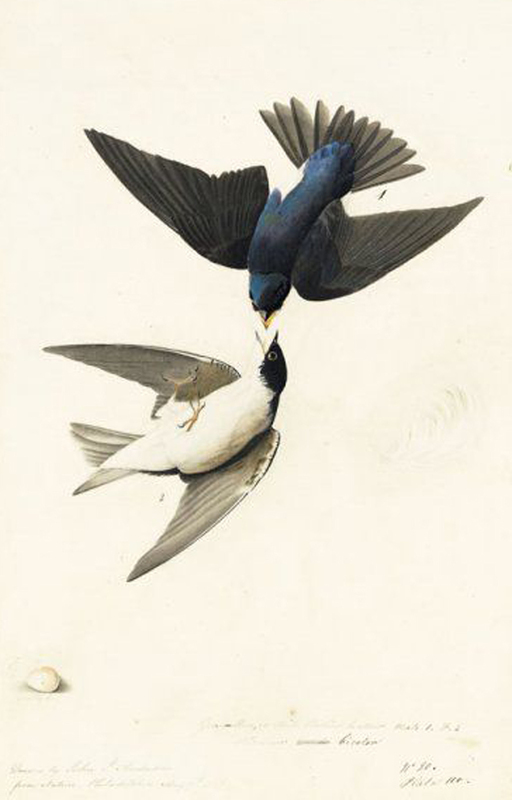 While many swallows and martins have proven highly adaptive when faced with human disturbances to their habitat, a few species have experienced declines. One species — the white-eyed river martin — was last seen in Thailand in the 1980s and very well may be extinct. Closer to home, the golden swallow is now found only on the island of Hispaniola after disappearing from Jamaica in the 1980s. The Bahama swallow, which nests on only four islands in the Bahamas, is also vulnerable. Incidentally, both these swallows are closely related to the tree swallow, with all of them belonging to the genus Golden Swallow. Translated from Greek, the genus name means “fast mover,” a quite accurate description of these graceful and agile flyers. 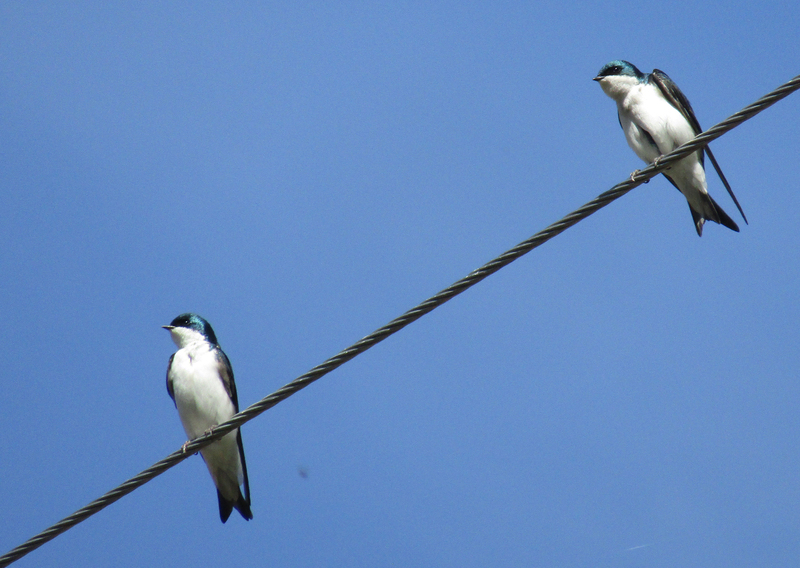 With their enthusiastic twittering to each other, tree swallows make for friendly neighbors. It’s also a pleasant diversion to watch them swoop over fields and ponds. To increase your chances of hosting your own tree swallows, offer a bird box placed in an open area. Right now is the time to attract their attention with some prime real estate. This entry was posted in Birding, Birds, Martins, Spring birds, Spring harbingers, Spring migration, Swallows, Tree Swallows, Uncategorized and tagged Birding, birds, Birdwatching, Bristol Herald Courier, Bryan Stevens, Carter County Compass, Elizabethton Star, Erwin Record, Golden Swallow, McDowell News, Northeast Tennessee, Our Fine Feathered Friends, Spring Bird Count, Spring migration, Swallows, Tachycineta, The Erwin Record, Tree Swallow on March 26, 2017 by Bryan Stevens.